Seventeen runners collapsed with hypothermia at a charity mud run in near-freezing temperatures. 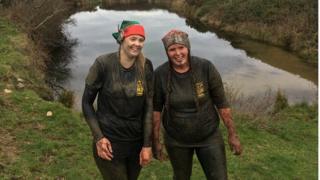 Two ambulances were called to the annual Christmas Mud Run in St Davids, Pembrokeshire, as another runner had to be stretchered off with a broken ankle. About 200 competitors took part in the event run by Man-Up UK on Saturday. Organisers blamed near-freezing weather conditions and poor preparation by some of the runners taking part in the four-mile race this year. Competitors had to wade through waist-high mud pits, clamber over obstacles and climb up rocky waterfalls during the race, which is in its eighth year. Man-Up UK director Fintan Godkin - himself an Ironman finisher and marathon runner - said it was the first time the charity race had seen so many casualties. "They were dropping like flies," he said. "At the finish line, 17 people were reported to have signs of hypothermia. We immediately wrapped them in space blankets, duvets, anything we could get our hands on to keep them warm and gave them hot drinks. "Some collapsed soon after crossing the line and others were collapsing in the showers. "Of the 17, four needed further treatment from paramedics who arrived in two ambulances. One had to be taken to hospital because her blood pressure had dropped very low, but she was discharged from Withybush Hospital later that evening." Mr Godkin said the runner who broke her ankle had fallen badly as she approached a 20-ft (6.1m) slide near the start of the course. She was stretchered back to the race headquarters and taken to hospital. He said temperatures on the day were between 4C and 7C. "Not as cold as some years and certainly not cold enough for us to have considered cancelling," Mr Godkin added. "Of course, the weather was a factor because runners get cold in the mud and water, but I think people also need to look at their preparations for these kind of events. "They need to ensure they have trained more specifically for the assault course nature of the race, not just the distance." He said 25 race marshals were out on the course, almost half of whom were qualified first aiders. Mr Godkin added: "In eight years, we've had 1,750 competitors and this is the first time we've had to call an ambulance." A Welsh Ambulance Service spokesman said it sent two ambulances to the event, while a number of people were checked over at the scene. At least 20 people are reported killed and 200 injured in explosions at churches and hotels.